Looking for a cool watch that's dressy? This is it! 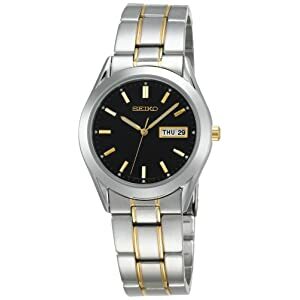 With a black dial face and gold hour markers, this watch gets noticed. The bezel and bracelet are stainless steel. The bracelet is two-toned silver and gold. The black, gold and silver colors are artfully combined in an attractive design. Lines mark the hours instead of numbers. Day and date are shown in the 3 position. Like most dress watches, the water resistance is only 30 meters (99 feet). Unless he's dressing up for an underwater event, that shouldn't be an issue. The movement is Japanese quartz for perfectly accurate time keeping. This is a very nice looking dress watch at a great price. Highly recommended!